Swinton Dog Training Ltd has been training dogs and their owners since 1991. Karen was one of the first dog trainers in the North West to join the Kennel Club Good Citizen Dog Scheme with Swinton Dog Training. Karen’s achievements were acknowledged by the Manchester Evening News paper in 2001 when her ‘Magnificent Seven’ passed the Gold award with flying colours (see article). 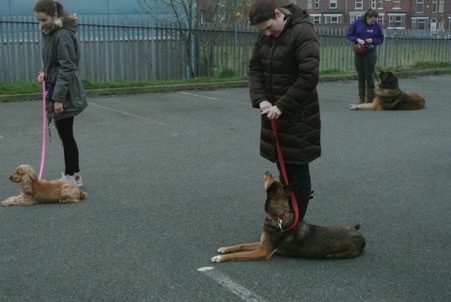 Swinton Dog Training offer a number of different weekly obedience classes. Beginner Training Classes are on Monday and Thursday evenings in Swinton town centre. Classes are held outside to ensure that the dogs don’t become stressed by training in an overcrowded room and to ensure owners have better control of their dogs during exercise periods. We train ‘rain or shine’ with the exception of Bank Holidays. Intermediate Training Classes are held at the training area on a Thursday evening. Puppy Socialisation Classes are held indoors on a Tuesday evening for puppies aged between 10 and 14/15 weeks. All newcomers to Swinton Dog Training Ltd are asked to complete a 6 week Beginner / Puppy course which is pre-registered. To sign up for this course, please use this printable registration form or contact Karen for one to be emailed or posted (see registration form). Week 2 to 6 – 5 weeks of basic obedience training with your dog. Our intermediate class is available to any dog and owner that have completed our beginner course. This 6 week course is a continuation of the exercises learnt in the beginner class. Our ongoing classes include further advance training and off lead work intermingled with some fun exercises to ensure you and your dog enjoy training together. Trainers are available at the end of each class for one-2-one help and assistance. Also note that the training club is not an ideal place for children, but if there is a child wishing to work their own dog they must be physically capable of being able to control it. Our puppy socialisation classes run every Tuesday evening from Wardley Community Centre, 30 Ash Drive, Wardley, Swinton, M27 9RS. These classes are available to puppies between 10 and 14/15 week old and once the puppy has received it’s first injection. The socialisation classes allow puppies to meet similar aged pups in a controlled environment before their critical socialisation period (17wks). The puppies are introduced to basic training while their owners are given help and advice to ensure their dogs grow into well balanced and sociable dogs. Classes also include handling, socialisation skills, house training and health and diet (see Puppy Class information). The socialisation classes are pre-registered to avoid potential overcrowding, please contact us directly to register on 07932 761042 or info@swintondogtraining.co.uk. 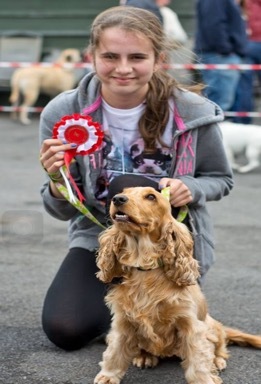 Laura & Cassie showing a First Place win at a local dog show. "Extremely useful to meet other dogs and people. Helpful for advice and information. Twice a week is good & I’ve really enjoyed coming as a new dog owner. A lot of patience & support from the trainer." - John Gray and Ben the Labrador from Eccles. Laura & Cassie, Kathryn & Sasha and Ellie & Tasker in the 'Halt In The Down' exercise. 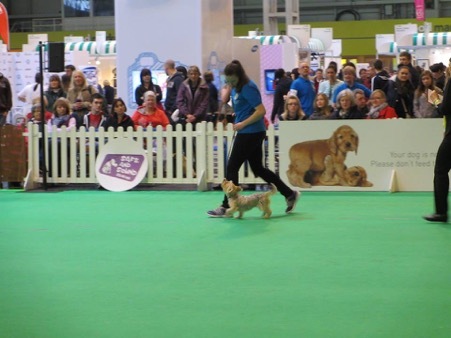 Ellie & Ruby completing the heelwork exercise at Crufts. "I am a lot more confident since training Sasha and meeting people at dog training." - Catherine with Sasha a cross Lurcher from Worsley.